Looks like Wii owners are due for an impending Data East flashback, as the Entertainment Software Ratings Board has weighed in on Data East Arcade Classics from publisher Majesco. 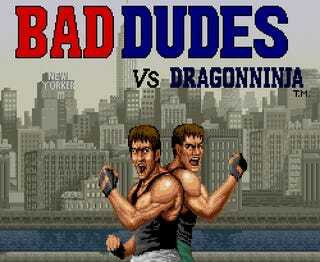 Even better than Bad Dudes? Expect "deep cleavage" and "provocative outfits." No, not from the two Bad Dudes seen above or President Ronnie, but from Magical Drop III, one of the titles included in the arcade game collection. That puzzle game is singled out for its suggestive jiggling. Other titles outed by the ESRB include Bad Dudes vs. Dragon Ninja (natch), Burger Time, Caveman Ninja, Street Slam, and Secret Agent. Not a bad list so far. If I were putting together a dream Data East collection, it would include—at the very least—oft-forgotten arcade gems like Heavy Barrel, Midnight Resistance, Two Crude, Tumblepop, Hippodrome and Robocop. Though, I don't expect that last entry would be legally feasible. Should Majesco find some way to include Tattoo Assassins on the disc, then I'd appreciate someone waking me up from this crazy dream.